I think the bubbles look kinda out of place, but I couldn't think of what else to put. Scan can be found here. it looks really cool! good job! adding this to my favs! just to let you know all the favs are NOT friend favs! okey? they are all just great! I am awe-strucked with your work Chloe-chan. I see no problems with the bubbles, buuut, they do seem to be out of place for this wall. Because of all the lightning effects, it isn't fighting perfectly, but it's also not all bad. And btw, I love the lightning effects. The colors were also blended in very well, like always. You've got great talent Chloe. The bg does seem like there was an explosion, a colorful one that is. Also I like the foggy effect you put around Sora's legs. It fits in perfectly. All in all, this deserves a fav. What, is this the 5th or 7th wall I've faved from you? It's either, I'm a sucker for your wallies, or that you always seem to out do yourself. Keep up the fantastic work Chloe, and I can't wait to see what you make next time. Groovy background you made here Chloe-Chan ;) I really love it; the colors are really matching so greatly, the lightening effects are looking cool and also the sparkles are fitting well with the background, but the bubbles although they really look great but I think you should remove them because they doesn't suit with the wallie! oh and by the way the font for the title is really fitting well with the wallie! keep up the superb work my friend ^ ^! Ooohhh... Sora from KH. And that scan! *points at it* I used that scan before in my wall. >.< Yeap, definitely have to agree that it's an awesome scan although it's overused. Lols, I really have nothing to say about your title. Hehehe. oh beautiful colors! love the background! 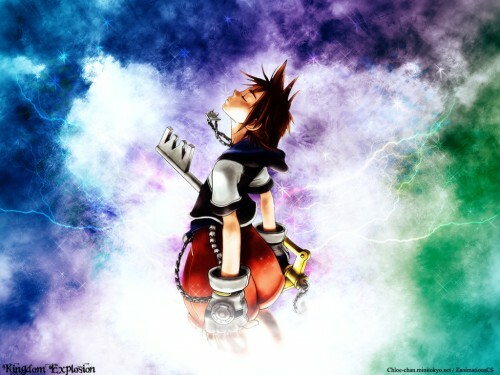 and it fits really well with the Sora pic! ^^ great job! It's a really nice wallpaper. I love Kingdom Hearts and your are right, this scan is great. I like the colors you chose and how they mixed and blend so well. I light the lightenings and the bubbles don't look bad either. Nice effects, I think you did a very nice work. I like the color you used. well, like I said the mixture of colour is nice but somehow it doesn't suit it wf the scan, I duno y.
but appreciate the time u spend. Great chloe-chan its awsome! It looked good as our computer background and it looks awsome on mine to hehe. love the colors and the effect the scan is really cool. The charater is really cute too. Great work and thanks for sharing it with us. Heyyy, long time no see. And I think that scan is from the manga, the scan looks nice, and so does the background, nice work!